First an admission: I’m a sceptic. I would like to believe in the paranormal and the subject does interest me, but until I see proof with my own eyes…..
With that in mind, I really did not know what to expect from this evening. 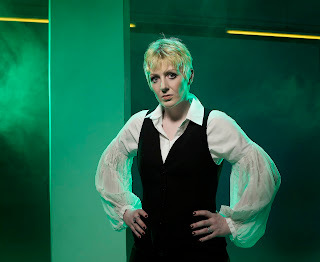 Yes I had seen Most Haunted before and so was aware of Yvette Fielding and her team’s work but the theatre brochure promised to take audiences on a journey back through time whilst challenging their deepest beliefs in a theatrical experience that was on a whole new level. So what was it to be? Entertainment or education? Real or fiction? The show opened with an intro from historian, Dr John Callow. Once he had explained that fear united all of us - believers and non believers alike – we were shown images of Anneliese Michel, a young Bavarian girl who was said to have been possessed by the devil after meddling in the occult. As she died, the sounds that came out of her were supposedly from Lucifer himself, and these haunting sounds were played to the audience as a warning of what could happen if things went wrong. So this was going to be an evening taking us through the concept of fear through the ages with a theatrical twist? Sadly no. The gravitas of this was swiftly destroyed as the production lurched into pantomime mode with another video, this time portraying a cliché riddled possessed Victorian child. The effect it had on the audience was to provoke laughter (sadly not of the nervous, fearful type) which was only added to as figures dressed in white ran through the audience – yes the shows 1st attempt to scare us was people in white sheets! Yvette was introduced and walked on to stage slowly to milk the audiences warm applause for as long as she could – or maybe I am being cruel and it was to build up tension (but if that was the case it failed). Soon she would be joined by Most Haunted favourites Karl, Stuart and Cath along with medium Billy Roberts and Demonologist Fred Batt. We were briefly told they were using Victorian techniques, including a bell that would never be referred to again, but that was the end to any historical education. What then followed was a tedious edition of Most Haunted – The Stage Show . An investigation was carried out in the basement area of the theatre with the audience watching action as it was played out on the large on-stage screen. For the most part this was split in to 4 – a fixed camera in the basement, another fixed in the deeper “well” area, a free moving camera and a camera locked off on the Ouija table on stage. All shots, with the exception of the one on stage, were bathed in the iconic green hue of night-vision that has become their trademark. As the evening carried on, various members of the team would go to the basement whilst others would lead séances and Ouija boards on stage. Audience members were selected (having already volunteered for duty by putting their name in a box before the show) to join the team but ultimately had little to do with the show. Occasionally names from the theatre’s past would be introduced by the medium but sadly these were not developed upon. And was he really getting this info from the spirit world – or had the more earthly Google been employed before the team had made their way to Stoke-on-Trent? The evening was littered with one-liners, which were supposedly off the cuff but were obviously scripted – including a joke regarding Arsenal FC’s style of play which was clearly intended to keep the locals amused (in fact this probably got the biggest reaction of the night). All this managed to do was destroy any illusion that this was a serious investigation – they were more intent on getting cheap laughs. During the evening we were asked if we could her ghostly sounds such as whistling – and yes we could! But with a theatres sound system at their disposal it isn’t a huge jump to conclude that the sounds were more than a little pre planned. As for light anomalies – well I saw lots amongst the audience, but that may have been the number of cameras which outnumbered those used by a bank of paparazzi and flashed distractingly during the entire performance despite the best efforts of the theatre staff. The experts (the good Dr, the medium and the demonologist) were criminally underused and restricted to bit parts (the trio of white sheeted ghosts who made 2 more appearances seemed to have more impact) as it focussed on the Most Haunted team as they felt cold drafts (surely not in an old theatre with many doors), stumbled around in the dark and scared each other. But despite my cynicism some in the audience did believe and reported back through a roving reporter how they could hear sounds, felt themselves tensing up and had gone cold. Yvette squealed how she really loved audience reactions – I bet she does, it must make her work all the easier. In desperation, the team resulted to swearing more and more as the evening drew on to provoke a reaction from their paranormal co stars but this just became boring and another nail in the coffin for a show lacking on any real ideas. The majority of the audience were left unimpressed though as the show grinded to its “climax” which resulted in the entire team in basement and the stage left empty. We had gone for an evening at the theatre and had ended up watching telly! The finale was obvious, abrupt and poorly executed. Sadly the evening did not work on any level. It was too contrived to be properly entertaining, there was little of theatrical merit and zero educational content. All in all it was a lazy cash in on the popularity of Most Haunted. If you are a fan of the tv show then go and see this - you will see your favourite stars and will no doubt enjoy the ride. For everyone else, believers and non-believers, look elsewhere for your paranormal fix.